The Quaser Vaporizer for concentrates from Airistech combines their advanced Q-cell heating technology with discreet pen style construction. Inside the Quaser heating chamber you have a built-in stainless steel dab tool that attaches to the mouthpiece for easy refills on the go anytime and anywhere. Remove the mouthpiece, scoop up some material, replace the mouthpiece and the tool perfectly places your concentrates on the quartz atomizer. Press/hold the single control button to begin heating your material. The fritted quartz coil provides an increased surface area for your material to distribute, resulting in more even heating for an impressive vapor quality. 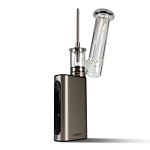 The Q-Cell quartz atomizer is powered by a premium lithium-ion battery with advanced variable output controls. 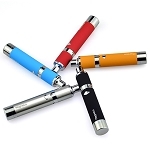 Five clicks powers the device on/off and three rapid clicks while it is on will help you change the voltage settings. The Quaser's high grade battery is manufactured with a long-lasting 420mAh capacity that will keep you going all day long. 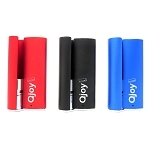 It also features an innovative preheat mode that uses a low output to warm the cartridge before use. Just press the power button two times and the Quaser begins heating for up to 10 seconds at a time, followed a sequence of different LED colors. 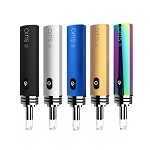 Invest in Airistech's Quaser Pen Vaporizer for concentrates today and enjoy the absolute best vapor imaginable on the go at the touch of a button.